This is a review of the Mekong Riverview Hotel in Luang Prabang, Laos, where I stayed in January 2015. This is the hotel I would come back to if I find myself in Luang Prabang again. 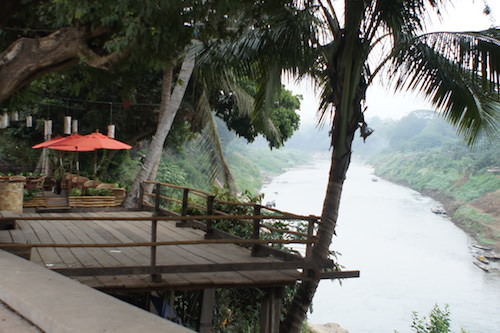 (1) It is located on the quietest, most secluded part of Luang Prabang at the tip of the peninsula where the Nam Khan River meets the Mekong River. This means you won’t get the noise and pollution from those loud smoke-belching scooters and tuktuks that plague the rest of Luang Prabang. Unlike in 2011 when I first came to this lovely town, Luang Prabang is now noisier and more crowded with large tour groups, motorbikes, vans and tuktuks, especially on the main roads in the center of town (not the roads by the river). The location of this hotel is perfect, if what you are seeking is peace and quiet. (2) It’s obviously a hotel where the owner (Swedish hotelier, Urban Paulsson) is present and watching over the place. Everything just works here. The staff are on their toes, ready to help you. The rooms are cleaned as soon as you leave in the morning for an excursion. The staff helped me find good restaurants, cooking classes, etc. They even have electric golf carts to take you around the town, if you wish — this means quiet, eco-friendly transport (boy, they need it in Luang Prabang!). (3) View Cafe (which belongs to the hotel): This is THE place to have breakfast, lunch and dinner. The food is REALLY good (Laotian and Western food), the views are fabulous and they have these little signs on their tables saying it is a SILENT CAFE, warning guests not talk loudly and not to talk on their cell phones. You will find out that in Luang Prabang now (unfortunately this was not the case 4 years ago when I visited Luang Prabang), a certain breed of tourist has discovered the place. This breed walks around with selfie sticks, a constant chattering loud mouth, cell phones and a general air of narcissistic cluelessness when it comes to other people. This breed is NOT welcome at View Cafe, thank heavens. Result: a civilised place to have a meal or coffee or tea. Three cheers to Mekong Riverview Hotel for preserving the atmosphere of Luang Prabang. (4) Breakfast: I had the Laotian noodle soup (nice and spicy), fresh papaya and pineapple, and fruit smoothies every morning, all of which were excellent. The breakfast is included in the price of the room. If you book, try to get a room on an upper floor with balcony and a view. The bathroom is large (and even has a separate urinal for men). There is air-conditioning and a ceiling fan (for those who hate airco). The balconies are spacious and comfortable, great for reading and just relaxing.